Quan Ho love duet singing has been recognised by UNESCO as an intangible cultural heritage. Bac Ninh province has made efforts to preserve the art to implement commitments to UNESCO on conservation and development of Quan Ho. Through eight performances, "The Quan Ho singing on the full moon night" organised by Bac Ninh City Culture and Sports Centre has left many good impression on the public. The programme has formed a playground for community cultural activities for local residents to cultivate knowledge and express love for this unique type of heritage. 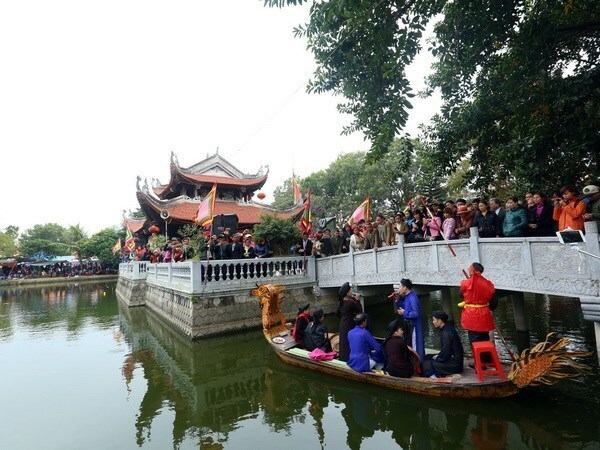 In the culture of Bac Ninh, the ancient Quan Ho songs create strong relationships between the Quan Ho guilds and those who love the traditional culture of Bac Ninh–Kinh Bac. Artisan Nguyen Thi Kim Quynh, Chairman of the Duong Xa Club, Bac Ninh City said singing folk songs on the full-moon night depicts our love for Quan Ho, and the eagerness to promote folk songs to a wider audience. Pham Minh Tuyet from Suoi Hoa Ward said she loves Quan Ho and often watches artists perform folk songs. She expressed her hope that local authorities continue to pay attention to supporting the artisans in preserving Quan Ho folk songs so they can be passed onto future generations. In recent years, Bac Ninh has invested in renovation and construction of cultural institutions. Of which, the key project is Bac Ninh Quan Ho folk theatre. The 90-billion-VND project boasts an area of 1.9 ha on four floors. It has a unique architectural design in the image of a house, dragon boat, a strip of peach silk and a large round hat, bearing cultural features of Bac Ninh–Kinh Bac. Le Manh Thang, Director of Quan Ho Folk Theater, said previously, without the current facilities, many artists tried their best to study, popularize and promote their folk songs to the community. With support provided authorities at all levels, the artists have been enthusiastic and motivated in conserving as well as staging new programmes to introduce Quan Ho to tourists, he said. Implementing its commitment to UNESCO, throughout the years, Bac Ninh has called for efforts made at all levels, branches and people's communities, in jointly implementing the project "Preserving and promoting the value of intangible cultural heritage, Bac Ninh Quan Ho folk songs and Ca tru in 2013-2020 ”. In particular, Bac Ninh is the leading province in developing mechanisms and policies to honour and reward artisans in the field of intangible cultural heritage, according to Resolution No. 213, 2015 of the Provincial People's Council. This is a move to nurture passion, enthusiasm, dedication of talents to preserve and promote the cultural heritage values of the nation.